This is our living room. I finally found the perfect curtains that match the pale gold in the living room and the dark red in the dining room--which was no easy task. I wanted curtains that would tie the two colors together somehow, and these work surprisingly well. The only downside is that they make the red walls look burgandy-ish, and I'd prefer a more vivid red. With the plaid, the woodstove, and all that dark furniture, the living room is looking very cozy Adirondack-y. This is the kitchen. I'm loving the cheery yellow color, which matches all my vintage art prints soooo well. I've got all my cast iron westies and scotties on display, and I couldn't be happier with how the room turned out. Here is the dining room. Next to the kitchen, it's my favorite room in the house. Somehow all my mis-matched furniture looks great together. And I love all the red. Just to diverge and story tell for a second: The sideboard on the far left wall was my great grandmother's. My grandfather was one of eleven children and got very very little of his mother's things when she died. He found her sideboard in a trash pile at his sister's house--about to be burned because it had a broken leg--brought it home, fixed the leg, and held on to it. My grandfather also made the lamp sitting on it--out of an antique phone. The pie safe (behind the dining room table) came from a cabin in Wisconsin that my grandparents inherited, and somehow survived several years there, exposed to the elements when the cabin's roof caved in. My grandfather brought the pie safe home to Asheville, soaked all the wood pieces in the bathtub, flattened the warped boards as best he could, and lovingly re-assembled it. I was *not* moving into this house without it. It looks like it was made to go in the room. This is the converted attic/master suite. It's been so nice to have an adults-only space in the house with our own closet, sitting area, and bathroom. We still need to get some furniture for that empty alcove (maybe a futon?). 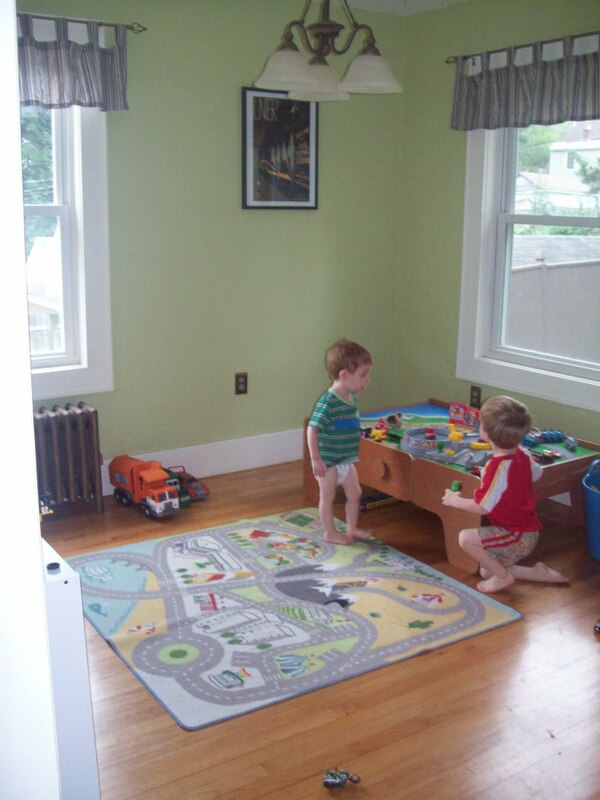 Here's the boys' playroom (which is never ever this clean). It's great for them to have a dedicated place to store their toys, and since it's right off the kitchen, I can easily keep an eye on them. I think it'll be a great computer/game room for them when they get older, too.